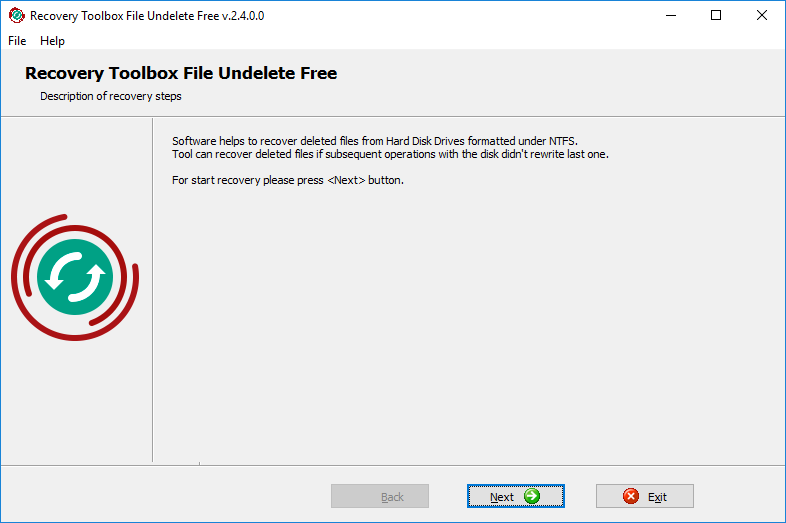 Recovery Toolbox File Undelete Free (Download) is a freeware recovery tool that is compact, reliable and a breeze to use. However, some users, especially those not very familiar with recovery software and data recovery in general, may encounter problems using the program and have questions. Therefore, we created this usage manual that addresses every aspect of the program's operation and should answer any questions you may have. Please read this document prior to contacting our customer support department. 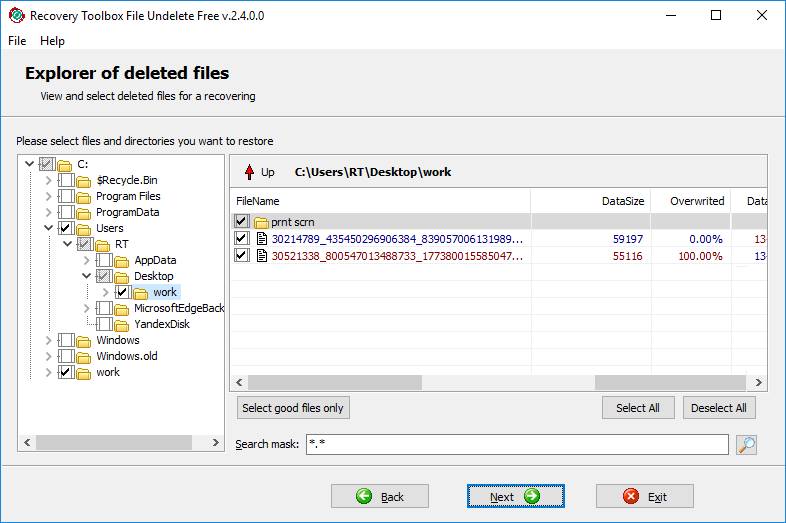 Recovery Toolbox File Undelete Free features an intuitive wizard-based interface that requires a bare minimum of your involvement in the process. The recovery process itself is broken into several distinct steps, each prompting you for specific information or action. All you need to do to successfully recover your files is to read on-screen instructions, enter the necessary information or perform the requested action and eventually click the Next button to proceed to the next step of the process. Please note that the program must be started with administrator rights to work correctly. This is the startup screen of the program containing a welcome message and prompting you to click Next to carry on with the recovery process. Please do so and you will be taken to the second step. On this step, you will need to select the necessary disk from a list of NTFS-formatted drives detected in your system. Just pick the necessary drive letter from the list and click Next. 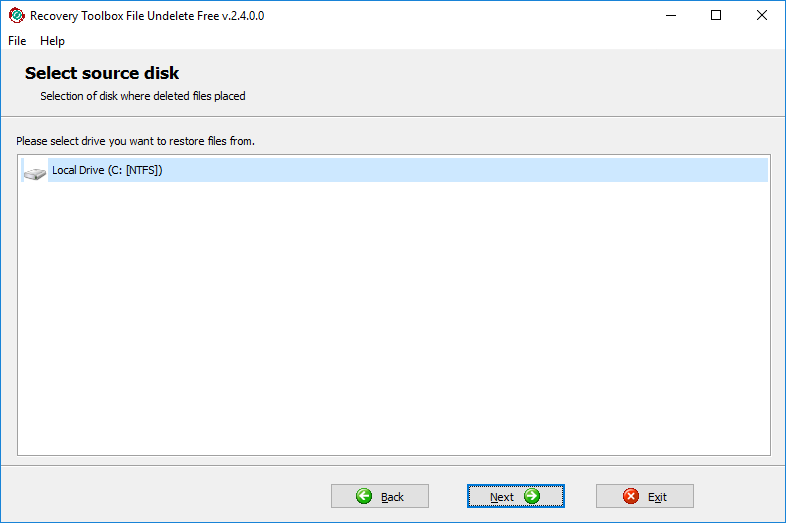 The program will start scanning the drive for deleted files and folders. As a rule, this process takes a few seconds, but it may take longer in your case, depending on the size of the drive and its structure. Once done, the program will automatically open the next screen of the recovery wizard. This is the main screen of the wizard that enables you to browse the deleted files and folders and mark them for recovery. If you are not sure about the location of a specific file, you can use the built-in search function that also supports search masks (use an asterix (*) to replace any sequence of characters in the name of the file or its extension). This screen of the recovery wizard it split into two functional areas. The left part of the window contains a folder tree that allows you to browse deleted folders on the selected drive. The contents of each folder are shown in a table in the right part of the screen that also displays important file characteristics and properties. You can quickly move up one level by clicking a red arrow above this table. The table displays a list of deleted files in the currently selected folder and their properties: size in bytes, the deletion timestamp, its attributes and, most importantly, the degree to which the hard drive area that formerly stored the file has been overwritten. If a file has been overwritten, recovery will be impossible. To speed things up, you can use the Select good files only button below the table to quickly select the files that can be restored with a high degree of certainty. The Select all and Deselect all buttons to the right let you select all the files or drop the selection, respectively. The same functions are can be accessed through a popup menu opened by right-clicking anywhere inside the table. Once you have selected the files to be recovered, click the Next button at the bottom of the window to proceed to the next step. At this stage of the recovery process, you will need to specify the location to which the files you selected will be restored. This can be done in one of the following ways. To select an output folder, type its name and path into the input field located at the top of the program window or use the standard Windows open file dialog by clicking the corresponding button to the right of the field. You can also select one of the previously used locations from the dropdown list that can be opened by clicking a small button with a downward arrow in the right part of the input field. You will also need to set the restoration mode parameter. Choose Directory tree if you want the program to recreate the original folder structure in the specified location or One directory for all files if you want Recovery Toolbox File Undelete Free to recover all the marked files to a single folder of your choice. Finally, select the action to be taken if a file with the same name is found in the specified output location. 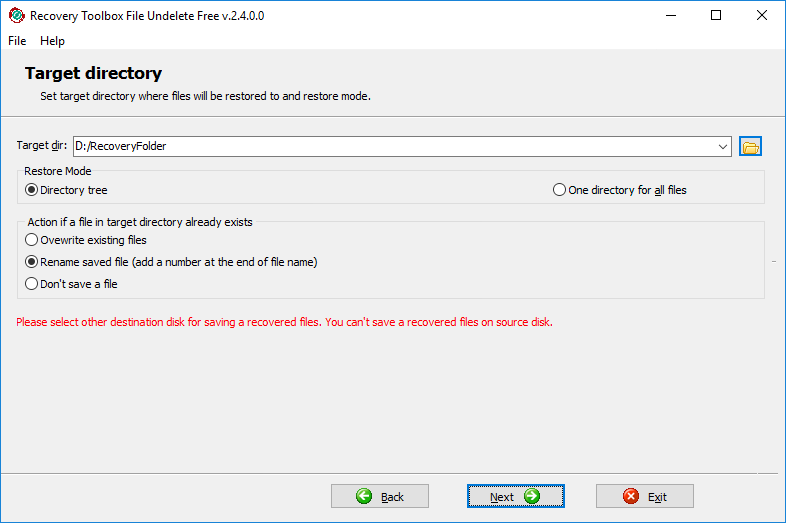 The program can either overwrite the old file, rename the new file by adding a number to its name or skip the recovery of this file altogether. Once all of these parameters have been set, click the Next button to proceed to the final step of the recovery process. This is the final screen of the wizard that contains a log of the performed actions and a brief summary for this recovery session: the number of objects recovered, their size, etc. At this point, you can either close the program by clicking Exit or use the Back button to return to the previous stage and repeat the recovery using different parameters. You can also click Back all the way to the first screen to recover a new file or set of files. 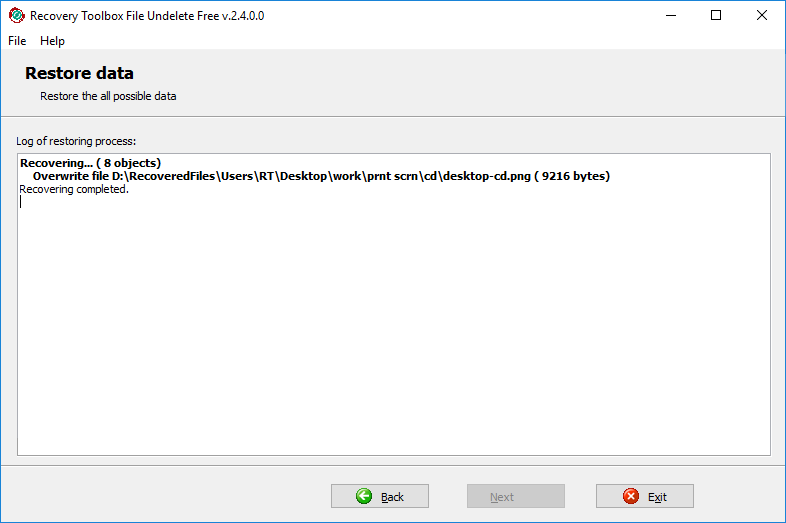 As you see, Recovery Toolbox File Undelete Free is as intuitive as it gets. Should you have any questions or problems with the program, please do not hesitate to contact our support department - we'll be glad to be of assistance.